Dubai-based investment fund KBC Aldini Capital Ltd. has cast a gloomy shadow over David Baazov’s C$3.6-billion bid to buy Canadian gambling giant Amaya Inc. The private equity firm’s CEO, Kalani Lal, denied on Tuesday any involvement in the deal. Mr. Lal told Canadian newspaper Globe and Mail that he had no knowledge of Amaya’s activities and that neither his company nor its related entities were involved in the proposed acquisition of the gambling operator in any way. On November 14, David Baazov, former Amaya Chief Executive and Chairman, made a formal bid to acquire the company for C$24 per common share, or C$3.6 billion. Including debt, the deal was valued at more than C$6 billion. Mr. Baazov said in his filing to the US Securities and Exchange Commission that he had received financial backing by four funds, with those being KBC Aldini Capital Ltd., Goldenway Capital SPC, Head and Shoulders Global Investment Fund SPC, and Ferdyne Advisory Inc. The bid came as a bit of a surprise, given the fact that Mr. Baazov is currently being investigated by the Québec securities regulator Autorité des Marchés Financiers (AMF) over alleged insider trading activities related to the acquisition of Isle of Man-based Rational Group. Amaya bought the owner of online card room PokerStars for $4.9 billion in the summer of 2014. If Mr. Baazov is found guilty on the insider trading charges, he could spend up to five years in prison. However, with the KBC Aldini Capital CEO claiming that his firm was not involved in the Amaya bid, the gambling operator’s former head could get into even more serious trouble. Mr. Lal basically suggested that Mr. Baazov had provided the SEC with false information about his multi-billion offer to buy the company he had himself founded, and to take it private. 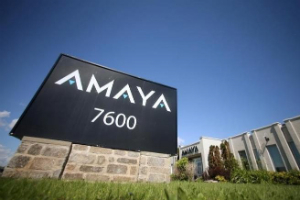 Following the announcement about the C$3.6-billion bid, Amaya’s shares jumped 18%. If the information about the KBC Aldini Capital financial backing indeed proves untrue, Mr. Baazov may be charged with filing a false statement to the SEC, probably in an attempt to manipulate the gambling operator’s stock price. Shares in the Canadian company dropped around 6% only several hours after Mr. Lal’s statement was published. Earlier today, Amaya’s Board released a statement, saying that it had been informed about the latest reports and that it would continue reviewing Mr. Baazov’s offer, taking into consideration KBC Aldini Capital’s denial of any involvement. It is also understood that law firm Block & Leviton LLP would investigate “potential securities fraud or manipulation claims” in relation to the proposed acquisition.